Fani-Kayode blasts Gbenga Daniel over imminent defection to APC – Royal Times of Nigeria. 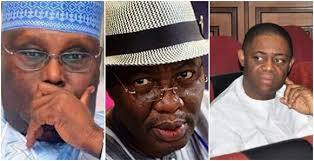 Former Aviation Minister, Femi Fani-Kayode has described as tragic the decision of former Ogun state governor and Director-General of the Atiku Campaign Organisation, Otunba Gbenga Daniel to join the All Progressives Congress, APC, after the presidential candidate of the Peoples Democratic Party, PDP, Atiku Abubakar was allegedly rigged out during the last election. Daniel had in a letter dated 14 March 2019 written to PDP national chairman, Uche Secondus, said he was quitting the party and partisan politics altogether. But his supporters and loyalists on Sunday converged at his Asoludero residence in Sagamu, demanding he leads them to the ruling All Progressives Congress (APC), a proposal Daniel said he was considering. Reacting to the stunning development, Fani-Kayode said that it was sad for Daniel to dump the party that thrust him into national limelight. He also criticized Daniel for dumping Atiku before the petition at the tribunal had been decided.